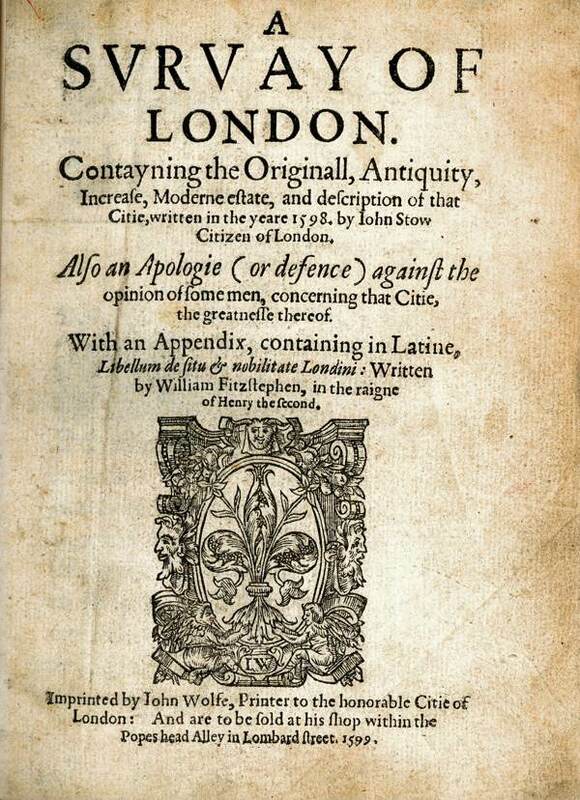 The Bishopsgate Institute has a 1599 copy of John Stow‘s Survey Of London and it touches me to see the edition that John Stow himself produced, with its delicate type resembling gothic script, and I find it sobering to recognise what a great undertaking it was to publish a book four hundred years ago – requiring every page of type to be set and printed by hand. 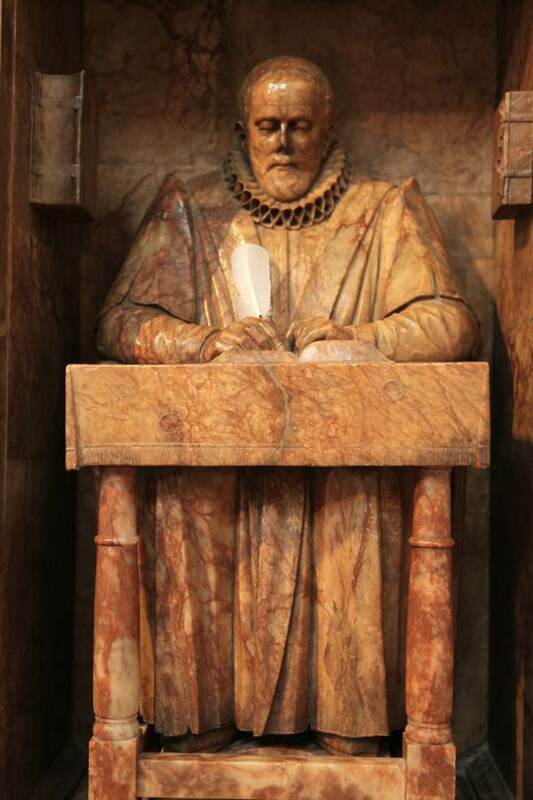 Yet in contrast to the dramatic changes he witnessed at first hand, John Stow also described his wonder at the history that was uncovered by the redevelopment, drawing consolation in setting his life’s experience against the great age of the city and the generations who preceded him in London . There is a large close called Tasell close sometime, for that there were Tasels planted for the vse of Clothworkers: since letten to the Crosse-bow-makers, wherein they vsed to shoote for games at the Popingey: now the same being inclosed with a bricke wall, serueth to be an Artillerieyard, wherevnto the Gunners of the Tower doe weekely repaire, namely euerie Thursday, and there leuelling certaine Brasse peeces of great Artillerie against a But of earth, made for that purpose, they discharge them for their exercise. Then haue ye the late dissolued Priorie and Hospitall, commonly called Saint Marie Spittle, founded by Walter Brune, and Rosia his wife, for Canons regular, Walter Archdeacon of London laid the first stone, in the yeare 1197. 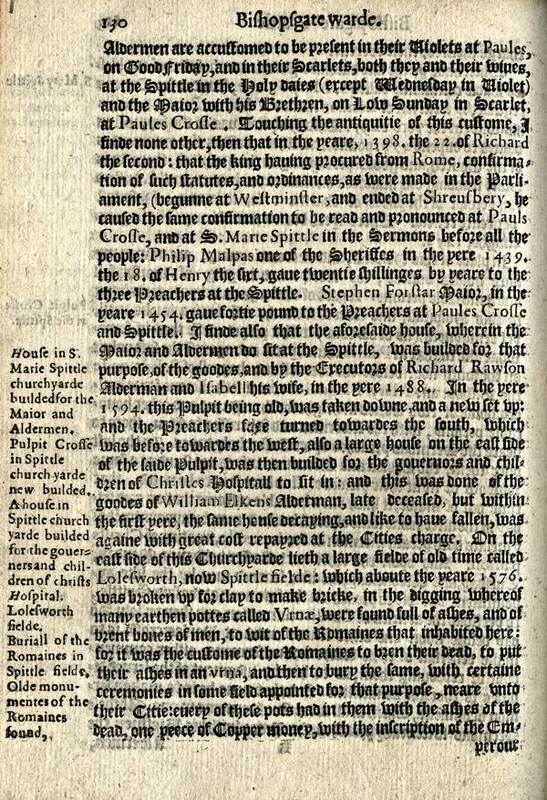 On the East side of this Churchyard lieth a large field, of olde time called Lolesworth, now Spittle field, which about the yeare 1576 was broken vp for Clay to make Bricke, in the digging whereof many earthen pots called Vrnae, were found full of Ashes, and burnt bones of men, to wit, of the Romanes that inhabited here: for it was the custome of the Romanes to burne their dead, to put their Ashes in an Vrna, and then burie the same with certaine ceremonies, in some field appoynted for that purpose, neare vnto their Citie: euerie of these pots had in them with the Ashes of the dead, one peece of Copper mony, with the inscription of the Emperour then raigning: some of them were of Claudius, some of Vespasian, some of Nero, of Anthonius Pius, of Traianus, and others: besides those Vrnas, many other pots were there found, made of a white earth with long necks, and handels, like to our stone Iugges: these were emptie, but seemed to be buried ful of some liquid matter long since consumed and soaked through: for there were found diuerse vials and other fashioned Glasses, some most cunningly wrought, such as I haue not seene the like, and some of Christall, all which had water in them, northing differing in clearnes, taste, or sauour from common spring water, what so euer it was at the first: some of these Glasses had Oyle in them verie thicke, and earthie in sauour, some were supposed to haue balme in them, but had lost the vertue: many of those pots and glasses were broken in cutting of the clay, so that few were taken vp whole. 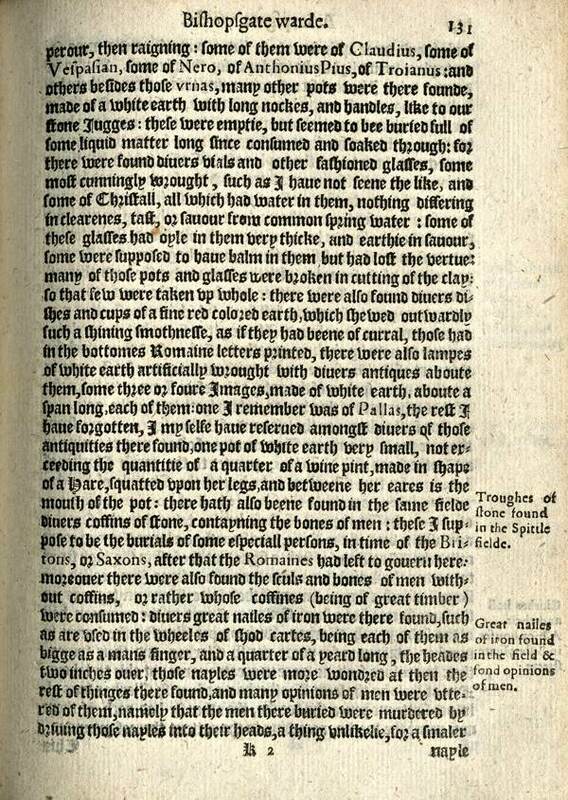 There were also found diuerse dishes and cups of a fine red coloured earth, which shewed outwardly such a shining smoothnesse, as if they had beene of Currall, those had in the bottomes Romane letters printed, there were also lampes of white earth and red, artificially wrought with diuerse antiques about them, some three or foure Images made of white earth, about a span long each of them: one I remember was of Pallas, the rest I haue forgotten.I my selfe haue reserued a mongst diuerse of those antiquities there, one Vrna, with the Ashes and bones, and one pot of white earth very small, not exceeding the quantitie of a quarter of a wine pint, made in shape of a Hare, squatted vpon her legs, and betweene her eares is the mouth of the pot. There hath also beene found in the same field diuers coffins of stone, containing the bones of men: these I suppose to bee the burials of some especiall persons, in time of the Brytons, or Saxons, after that the Romanes had left to gouerne here. Moreouer there were also found the sculs and bones of men without coffins, or rather whose coffins (being of great timber) were consumed. Diuerse great nailes of Iron were there found, such as are vsed in the wheeles of shod Carts, being each of them as bigge as a mans finger, and a quarter of a yard long, the heades two inches ouer, those nayles were more wondred at then the rest of thinges there found, and many opinions of men were there vttred of them, namely that the men there buried were murdered by driuing those nayles into their heads, a thing vnlikely, for a smaller naile would more aptly serue to so bad a purpose, and a more secret place would lightly be imployed for their buriall. And thus much for this part of Bishopsgate warde, without the gate. Amateur he may have been, but Stow’s evocative prose put flesh upon history – and his own time’s interaction with and perception of history – in a way that most modern historians (however more forensically practised) struggle to match. 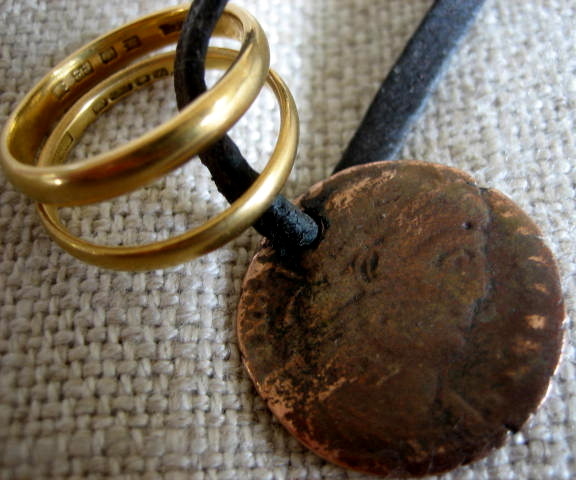 A historian myself, I’ve treasured his ‘Survay’ all my adult life. Thank you for this post, it must have been quite wonderful to see John Stow’s original work over 400 years after it was produced. I have a modern copy of John Stow’s work as my paternal grandmother (herself born a Stow in Bermondsey) always maintained that her family were direct descendants of his. She wrote a fictional work of John Stow’s daily life which was finished by my uncle after her death. My uncle, sadly now also deceased, bore a very close resemblance to his ancestor John.